Please note, you do not need to be a subscriber to enter this meet. If you cannot navigate away from the paywall after you login, please open a new window and go straight to the meet page. You will still be logged in and should be able to enter the meet. Discus Added back this year!! Note that club addendum is at the bottom of these instructions and individual instructions are just above that. COACHES PASSES: If you enter 4 or more athletes, you will be given 2 coaches' wrist bands at no charge. All others must pay the $10 Admission fee to enter. What happens when Flo throws a track meet? Expect an experience! The 2017 Flo Golden South Classic is about fast times and fun times as music rocks the enfield, dance contests get you moving, food trucks serve up good eats and other fun games and prizes are won throughout the day. ** All events heats against time. **Eligibility: All athletes must have been eligible to compete for their High School Team in order to participate in the Golden South. NOTE: stay close to the DJ throughout the day and compete in one or all of the spontaneous contests and prizes that will held at the main stage on the enfield! All middle and high school-aged athletes meeting his or her state high school eligibility standards are welcome to compete in the 2017 Flo Golden South Classic! 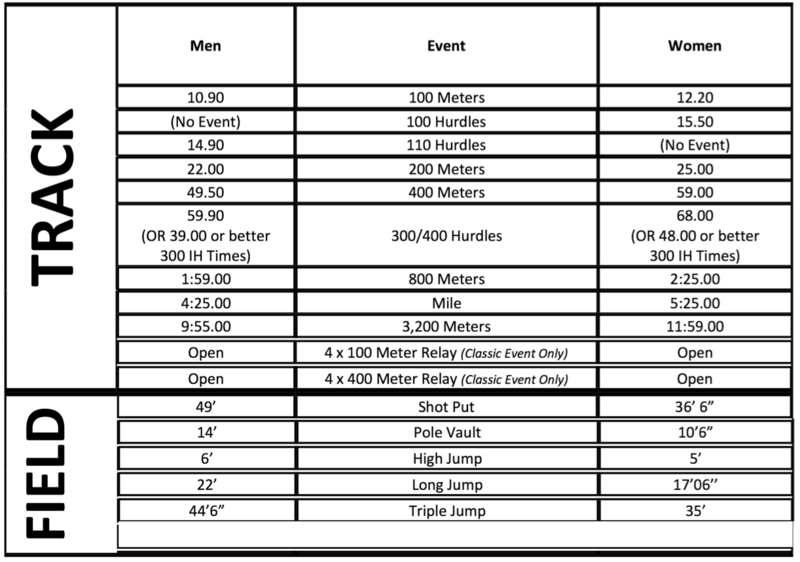 To compete in the Classic Division, you must meet the qualifying standards. All other athletes will be placed in the Open Prep Division. What are the Classic Division Qualifying Standards? 2017 Classic Division qualifying standards are below. Note to State Champions: you may be eligible for a bye to the below standards. Please Contact kenbrauman@aol.com for more information. Do coaches have to pay to get in? GS will provide 2 wrist bands for coaches who enter more than 4 athletes. Everyone else must pay the $10 admission fee to enter. Who gets awards & where do we go? Awards will be given to the top 6 finishers in each division. PREP - Awards will follow the conclusion of each event in the PREP Division. Once the final results are posted (on the side of the white building), the top 6 in each event may proceed to the PREP AWARDS tent located directly across from the white building to get their medal. CLASSIC - The TOP 3 finishers in each event will receive their medals on the stage located in the infield. 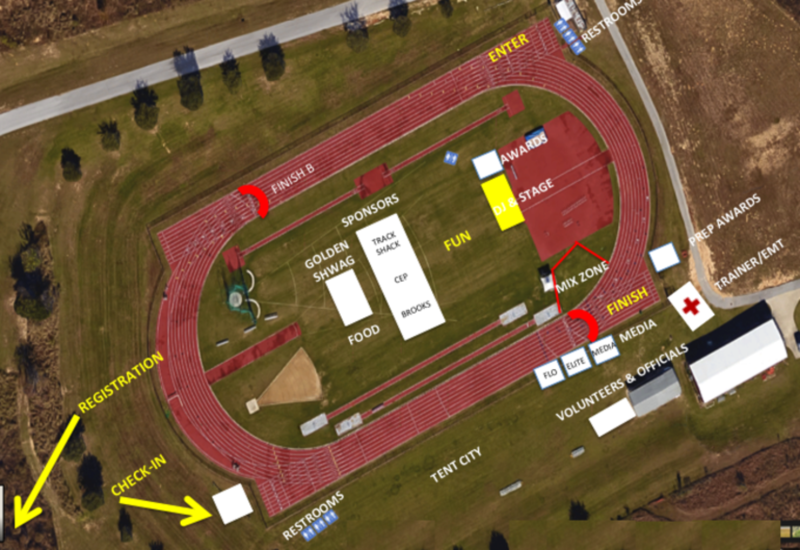 PLACERS 4, 5, and 6 may get their medals at the tent located adjacent to the stage. Close-in parking will be marked and available for $5. If you dont mind a walk, there is additional street and other parking available at no charge. Golf carts will be provided as transportation for the disabled or anyone unable to make the trek down the hill to the track. ADA restrooms are located at the northeast end of the track. All the action (food, music, games and more!) will take place on the infield of the track -- it's where the party's at! Should you want to take a break in the shade, there is ample grass ampitheather-style seating along the outside of the track. Blankets and foldable chairs are welcome! We all know FL Weather is unpredictable, so we do not suggest scheduling same-day travel to or from the event. Get in early, get comfortable and ready to compete! No refunds will be offered due to inclement weather conditions. If theres severe weather, events will initially be delayed with hopes to resume later in the day. Worst-case scenario, the Flo Golden South Committee will make the decision to either cancel or postpone the event until the following day or following weekend. Such decisions are made only in the interest of safety. Meet fees are $28 per athlete to enter the meet. This must be paid by credit card upon entry. There is no meet payment on meet day. Sorry, there are No registration refunds available for this event. There are NO LATE ENTRIES, DAY OF MEET FILL-INS, OR FEES AFTER THE MEET ACCEPTED! No replacing athletes in events. No changes the day of the meet! A Trainer and Student -Trainers will be on hand to handle first aid and emergency situations during the competition. There will be no access to advanced equipment (ultra-sound, stimulation, etc.). Ice and heat packs will be available.